Ready to start making your Zadie dress? Today I’m going to walk you through the first steps – exciting! First things first – take your measurements, choose your size and make any initial adjustments to the pattern. Go back a couple of posts to read up on sizing and fitting for the Zadie dress. If you haven’t yet cut out your fabric, do that now, and add the markings as explained on the ‘Cut Your Fabric’ page of the instructions. Be sure to mark the pivot points on carefully to all the pieces that need them – these will be really helpful later for getting neat corners on those Z-shaped seams. Have a read of this post I wrote on how to cut knit fabric if you haven’t done it before. 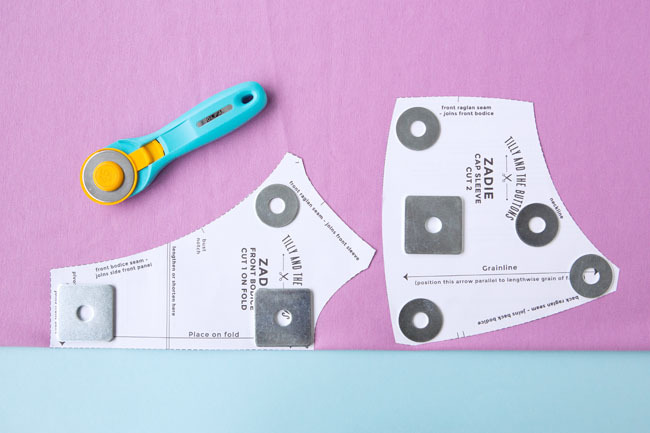 There are cutting layout diagrams in the Zadie instructions that show you how to cut the pattern without wasting fabric. If you’re making a colour blocked version, you can download extra cutting layouts at the bottom of the Zadie page on our shop. 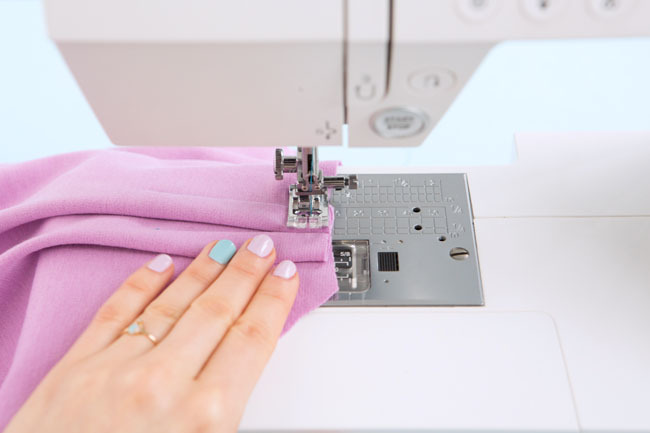 You can sew Zadie either entirely on a regular sewing machine, or partly on a regular machine and partly on an overlocker or serger if you have one. The instructions booklet includes some tips on sewing knit fabrics. If you need extra help, take a look at my online video workshop Learn to Sew Jersey Tops – it takes you through cutting and stitching techniques for stretchy jersey on a regular home sewing machine. 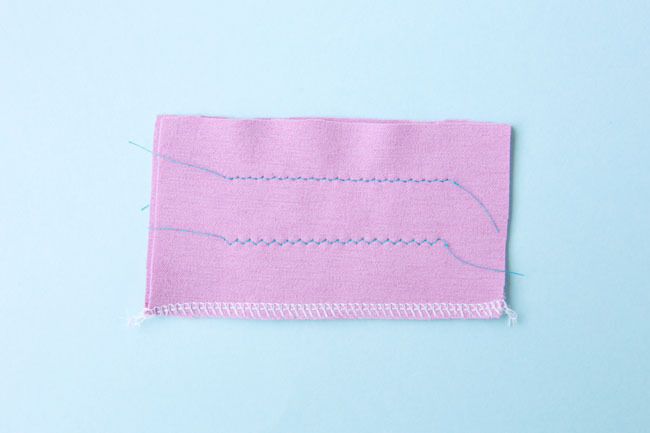 If you do have an overlocker or serger, I don’t recommend making the whole thing on it – there are lots of seams involved, and in some places you are stitching between two points rather than edge to edge. The overlocker can make it difficult to stitch precisely between points as it will cut through or stitch over bits it’s not meant to. So use your regular machine for most of the sewing – the instructions say when you can overlock or serge if you want to. One more tip before we start sewing – the unusual style lines on this pattern mean that it may not be immediately obvious to you which seam is which. We always label the seams on our sewing patterns so you can see what’s what – so if you can’t work out which seam I’m telling you to pin or stitch in this sewalong, take a look at the pattern sheets. One of our pattern testers also found it helpful to mark the initial of the seam on the wrong side of the fabric in chalk pencil. Hopefully you won’t need to do that as I’m going to show you looooads of photos to explain the steps, but something to consider if you get lost! Ready to sew? Let’s go! Let’s get sewing! We’re going to start by stabilising some of the seams that will come under strain when you wear your dress, to help stop them stretching out of shape and drooping with the weight of the skirt over time. You can use stay tape, clear elastic, ribbon or strips of knit interfacing as stabiliser – basically, something that will hold its shape, preferably about 6-8mm (1/4in) wide. I like to use satin ribbon as it’s easy to get hold of and adds a pretty detail to the inside of the dress. 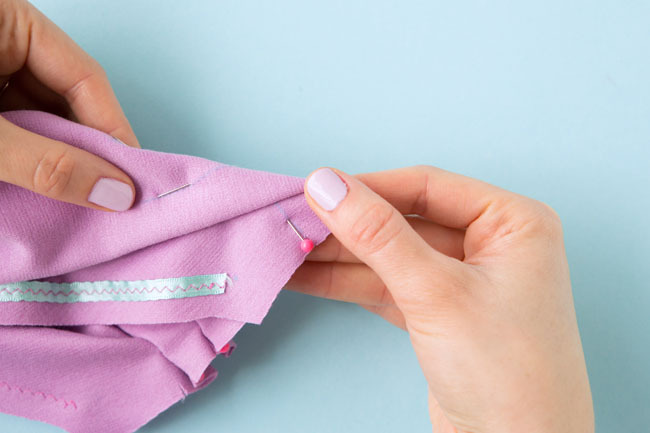 Pin the stabiliser to the wrong side of the fabric, lining it up so it’s a little less than 15mm (5/8in) from the fabric edge – so it’s close to the seam you’ll be stitching later, but not so close that it will overlap the seam line and be bulky. Snip off the short ends of the stabiliser so they’re about 15mm (5/8in) from each end – this will avoid the seam allowances of the other seams so the layers don’t get too cumbersome later. 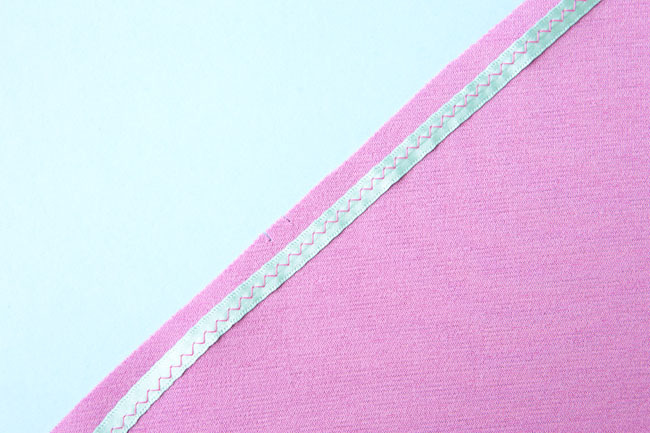 Attach the stabiliser using a wide zigzag stitch on your sewing machine – or press it on with a dry iron if you’re using fusible tape. Now we’re going to make the pleats on the skirts. You should have marked four pairs of pleat lines on both the front skirt and back skirt. 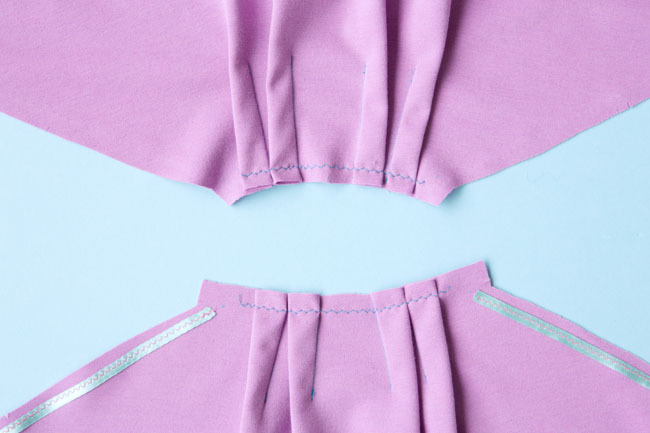 Bring each pair of pleat lines directly on top of each other by folding the fabric right sides together between them. Pin each pair of pleat lines together along the lines. 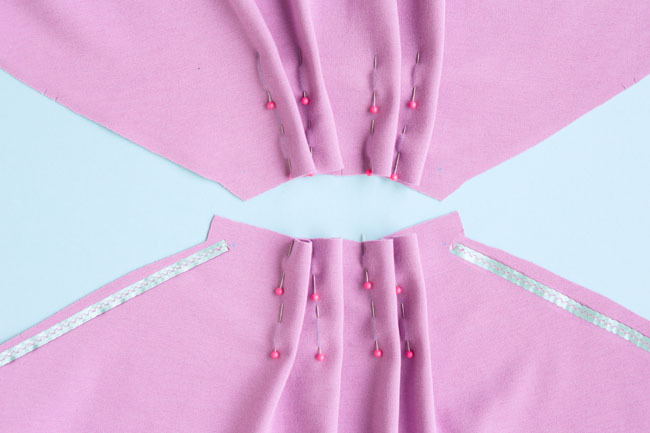 To make accurate pleats, check the pins are exactly on the lines on both sides of the pleat. Press the pleats towards the side seams. To hold them in place, tack (baste) horizontally across the top with a long zigzag stitch (about 2.5mm wide by 4mm long), 10mm (3/8in) from the edge.